While many Climate Activists rail at capitalism and the GOP as climate change pushers, our Chinese frenemies have also taken a giant leap toward Mutual Self-Assured Climate Destruction. China’s Belt and Road Initiative is a colossal infrastructure plan that could transform the economies of nations around the world. But with its focus on coal-fired power plants, the effort could obliterate any chance of reducing emissions and tip the world into catastrophic climate change. The more than 70 countries that have formally signed up to participate account for two-thirds of the world’s population, 30 percent of global GDP, and an estimated 75 percent of known energy reserves. Just building the land-based Silk Road Economic Belt and the 21st Century Maritime Silk Road will absorb massive amounts of concrete, steel, and chemicals, creating new power stations, mines, roads, railways, airports, and container ports, many in countries with poor environmental oversight. But more worrying still is the vision of industrial development to follow, and the energy that is planned to fuel it. While China has imposed a cap on coal consumption at home, its coal and energy companies are on a building spree overseas. 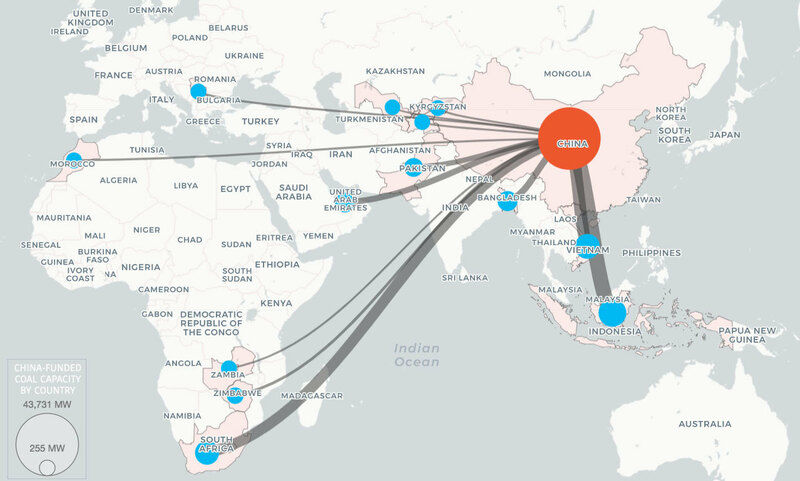 Chinese companies are involved in at least 240 coal projects in 25 of the Belt and Road countries, including in Bangladesh, Pakistan, Serbia, Kenya, Ghana, Malawi, and Zimbabwe. China is also financing about half of proposed new coal capacity in Egypt, Tanzania, and Zambia. Our Governor Inslee, currently running for POTUS, is behind the silicon smelter being built in Newport, WA, a lumbering town that sits in a bowl with mountains all the way around it. Coal, by the tons, is to be shipped in by railroad, tons of granite-bearing silica will be brought in by railroad from Canada that does not want the smelter built in their country. The smelter company predicts there will be tons of greenhouse gases released through the smokestack to be built across the highway from all our schools and within blocks of our new retirement home, our hospital and nursing home. The governor, our mayor, and city council claim the new industry will bring new jobs and revive our dying town. Enough is enough!! We live in a pristine part of the world with deep lakes carved out of the mountains by glaciers. The anticipated greenhouse gases will pollute our lakes and rivers, the gases will weaken our forests, soils, and wildlife, and the pollutants will fill our clean air with gases. The U.S. will contribute to an increased amount of pollution. With Chinese coal from "at least 240 coal projects" going to "Bangladesh, Pakistan, Serbia, Kenya, Ghana, Malawi, and Zimbabwe" pollutants from Chinese coal will spread even more greenhouse gases in Asia, Europe, Africa, and Indonesia. "China is also financing about half of the proposed new coal capacity in Egypt, Tanzania, and Zambia." Who is the enemy of the people and the planet, the corporations, the government, or those who resist the industries that use fossil fuels and contribute to global warming, whether in the U.S., China, Bangladesh, Pakistan, Serbia, Kenya, Ghana, Malawi, Zimbabwe," "Egypt, Tanzania, and Zambia?"